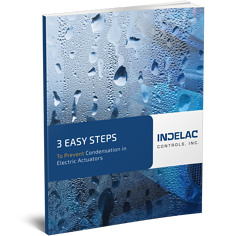 3 Easy Steps to Prevent Condensation in Electric Actuators | Indelac Controls, Inc. Unwanted condensation in or on electrical goods can have severe consequences. Metal parts, even stored in warehouses, can corrode or suffer surface damage as a result of condensation. Inside an actuator enclosure it can damage critical components that impair product quality or productivity of the equipment, possibly leading to a breakdown. How can such a potential problem be solved? Fill out the form to the left to access the eBook.